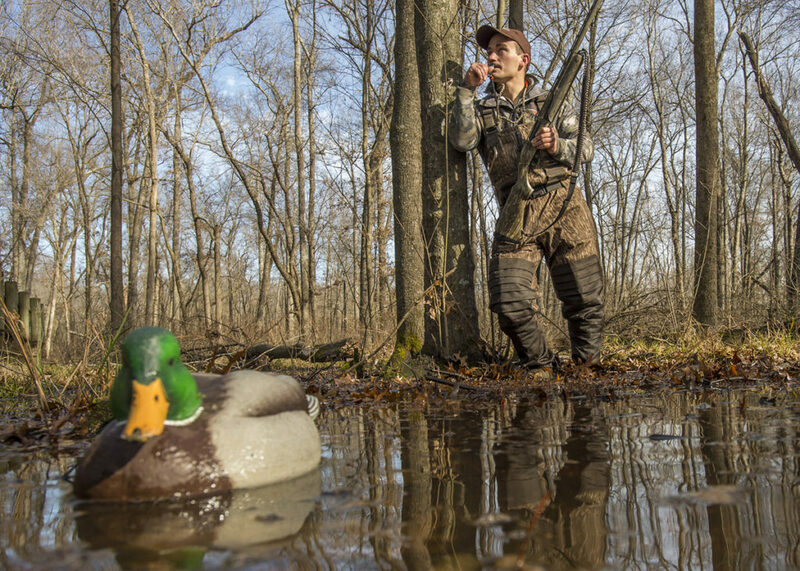 If you want to talk to duck hunters, you have to go where the ducks are. For an aspiring wildlife manager at Southern Illinois University Carbondale, that meant lots of early mornings at a local duck hunting hot spot perched nearby along the mighty Mississippi River. Ethan Dittmer’s work could help local wildlife managers better understand how hunters use the area, and also might reveal the best ways to get feedback from them. Dittmer, a junior in the zoology degree program, came up with the idea for a project studying hunters at Oakwood Bottoms Greentree Reservoir in the Shawnee National Forest. Created in 2015, the 1,200-acre refuge is operating on a three- to five-year trial basis. Up until now, no formal duck harvest data had been gathered at the refuge, prompting Dittmer, an avid duck hunter in his own right, to propose gathering it himself. 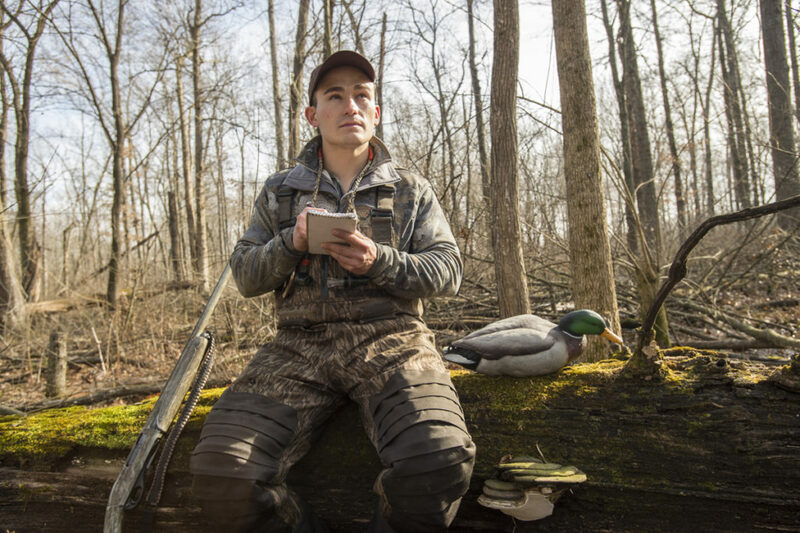 Working under the supervision of SIU doctoral student John O’Connell and Associate Professor Michael Eichholz, Dittmer focused his project on gathering duck harvest information and other feedback from hunters, which could in turn help managers make informed management decisions. Last February, Dittmer, along with other members of SIU’s Ducks Unlimited student chapter, met with staff and fellow hunters at Oakwood Bottoms. Dittmer took his idea for a survey to Eichholz and O’Connell, who encouraged him to pursue it and provided guidance on different survey methods. The trio developed a research project that included a pre-paid mail-in harvest paper survey and an online survey. The mail-in survey involved Dittmer placing survey cards on hunters’ vehicles while the online survey included URL/QR code signs at 10 popular access points for hunting the areas. “Online days” saw him start his work 15 minutes prior to sunrise, driving a standardized route and counting vehicles and recording locations. This allowed him to create a relative index for online participation. “Paper days” saw him start on the route at the same time while also placing surveys on hunters’ vehicles and recording their locations. The U.S. Forest Service funded the initial proposal for the project, which included sampling for 30 to 60 days of the season. Following this initial funding, Eichholz, along with Ducks Unlimited, provided additional funding, which paid for three additional student technicians to help with the project. “This helped other SIU students to get experience gathering field data and accurately recording it, and they were very important for the project,” Dittmer said. Dittmer, who completed the field work for his project in early January, said it’s important to monitor the effects of any management change, especially one that is solely aimed at harvest success for hunters of the area. And doing undergraduate research – something that SIU emphasizes – has given him a leg-up on his future plans, providing important experience in collecting and analyzing data, reviewing scientific literature and designing research projects.